No. 27, Jalan Industri Mas 12, Taman Mas, 47100 Puchong, Selangor, Malaysia. 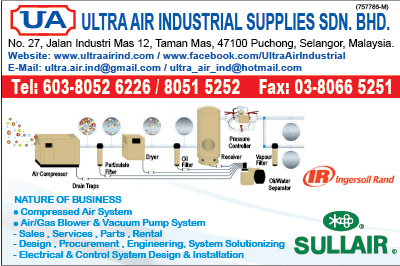 Ultra Air Industrial Supplies Sdn Bhd (UA) and Ultra Sol Engineering and Trading Sdn Bhd (USE) was registered and operated in since 2006 as a contracting, engineering and trading company specializes in compressed air system sales, service, parts, installation, air solution, preventive maintenance and troubleshooting. We provide a coordinated effort, from design, documentation, engineering, procurement, testing and commissioning through to customer’s certification and satisfaction. UA and USE approaches each new customer and project with the goal of making it the basis of an ongoing relationship. It is foundation upon which we’re building an impressive track record of performance. UA and USE minimizes project cost and time by eliminating duplicate design and construction team effort. We maximize engineering personnel from design through to construction. The continuity of personnel assures that the valuable information develop during the phase is carried through to the construction details.